It’s been a stonker of a summer, Britain was taken over by a huge heat wave followed by almost monsoon rains. 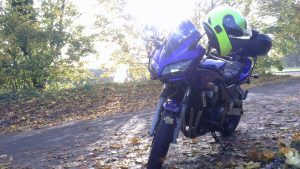 Now Autumn is well and truly upon us, the leaves are falling and everyone is all talk of end of season for biking… What’s that all about then?! There’s no such thing as bad weather, only bad choices of gear. As the temperatures drop, with decent textiles, thermals, Merino layers and heated gear etc, you can happily continue to enjoy the ride through the winter. Similarly for your bike, you may put away your fancy summer bike and revert to a winter/commuter hack, apply the ACF50, and you probably want to choose all weather tyres that gain heat quickly, but ultimately it’s just making the right choices of gear. So I say, screw this ‘end of season’ nonsense, just gear up and enjoy the ride whatever the time of year. And taking this to the logical conclusion, with the right choice of gear we can happily enjoy riding in all weathers, including freezing snow. It might take some decent thermals and spiked tyres, but this doesn’t stop people enjoying the ride to the Primus rally in Norway as a fellow London biker I know can confirm. I for one will continue to ride day in and day out, with only my choice of gear changing. What’s your plan for riding through the autumn and winter?